By 8 a.m. every morning, chances are pretty good your inbox is flooded with emails about content marketing. There are so many great tips, tricks, and guidelines in the marketplace that it’s hard to know where to begin short of deleting everything and starting from square one—and we doubt you want to go to that extreme. One alternative to the morning onslaught of emails is to curate those same best practices, insights, and expert commentaries into a format even more portable than email. We’re talking, of course, about podcasts. Sure, you can’t pop your headphones in during a meeting, but you can listen to these portable broadcasts while you workout at the gym, run errands, or commute to work. 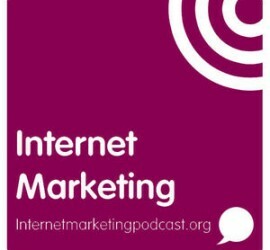 This podcast is your resource for all things digital marketing. 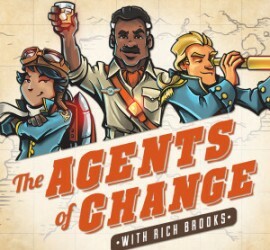 Host Rich Brooks sits down with the world’s leading marketers to get insider tips on SEO, social media, and mobile marketing. The podcast covers everything you need to know, from driving qualified traffic to converting leads, and publishes the highlights on their main page for easy skimming! 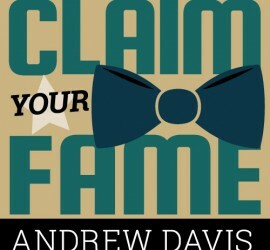 Marketing veteran Andrew Davis uses great storytelling to showcase the personalities behind some of the industry’s most successful businesses owners. The show uncovers how brilliant business owners have leveraged their passions and the online world to drive new revenue. 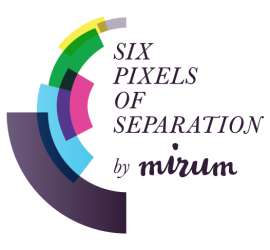 Mirum President Mitch Joel dives into the complex world of digital marketing and social media from the perspective of a digital marketing agency. His conversational style and high-profile guests offer interesting insights into our always on and always connected world. 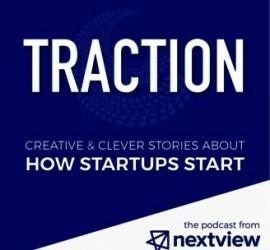 This podcast explores the art of writing great content in all its forms. 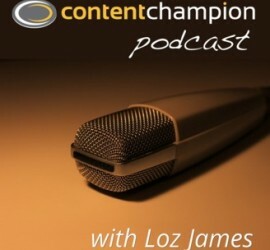 Loz James covers the strategies, tools, and tactics you’ll need to create vibrant and informative content for your business. Every week Pamela Muldoon invites a content marketing expert to join her on the podcast to chat about new content marketing trends. Muldoon’s smart, fun, and witty style make this podcast a great companion for your commute. 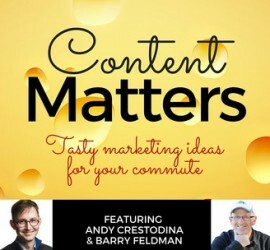 Copywriting experts Andy Crestodina and Barry Feldman chat about what makes marketing effective. Covering a variety of topics including writing great headlines, guest blogging, and doing great research, these 22-minute podcasts are easy to squeeze into your daily routine. John Jantsch is one of America’s leading small business marketing experts. 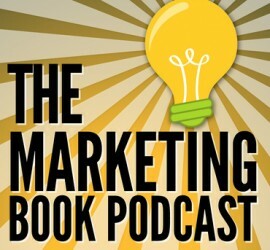 Tune into this podcast for interviews with authors, experts, and thought leaders sharing their content marketing tips and tricks. 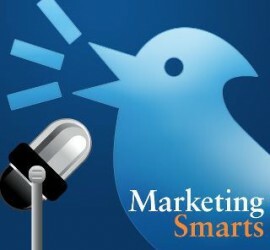 Think global with this popular UK marketing podcast. Every week over half a million people tune in for advice on digital and search engine marketing. Topics include multi-lingual ad words, topic research, and generating online leads. Professional content nerds rejoice! 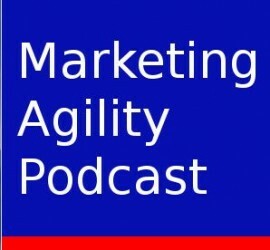 Technology, marketing apps, and agile project management are all favorite subjects on this podcast hosted by Frank Days and Roland Smart. 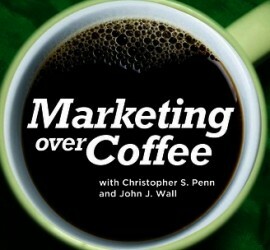 John Wall and Christopher Penn’s podcast sits “at the intersection of marketing and technology.” The duo sits down in a local coffee shop every week to chat with industry experts and authors about the latest marketing books, SEO, email marketing, and social networks. 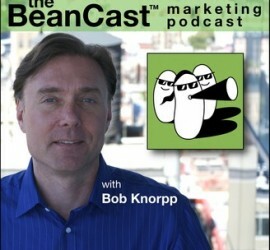 Hosted by MarketingProfs, this weekly podcast is an easy yet insightful listen at just 30 minutes per episode. Dive into actionable insights and real advice on topics ranging from branding, to storytelling, customer advocates, account-based marketing, and mobile-first marketing. 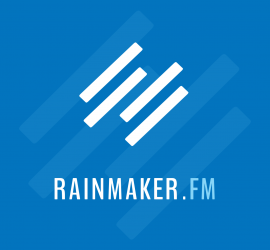 Rainmaker.fm is a network of broadsts that you can acess for free (with a simple registration). Topics include how to fix writing errors (Editor in Chief podcast), the value of live events (Youpreneur podcast), and how to write quality content (Zero to Book podcast). 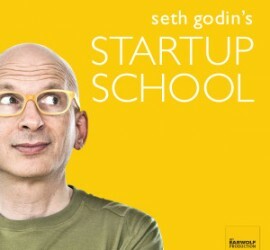 Marketing legend Seth Godin guides aspiring entrepreneurs through a workshop that explores the ins and outs of running a successful business. Small- and mid-size businesses are the target audience for this marketing podcast hosted by husband-and-wife team Wil Hart and Sydni Craig-Hart. 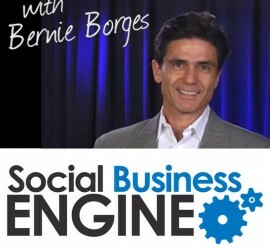 Bernie Borges interviews some of the most interesting marketing professionals at heavyweight companies including Walmart, Dell, and U-Haul. The podcast recently celebrated its 00th episode so there’s plenty of quality listening to be had. 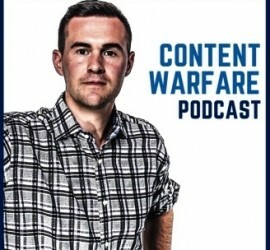 Michael Stelzner riffs on the power of video with Gary Vaynerchuck, shares insights into the virtues of comment threads, and walks us through the LinkedIn mobile app. 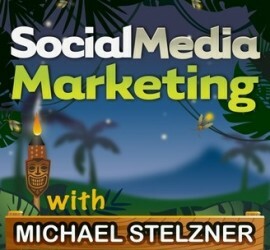 Stelzner’s podcast is a great resource for marketings looking to “navigate the social jungle” with the latest strategies, tactics, and tips. 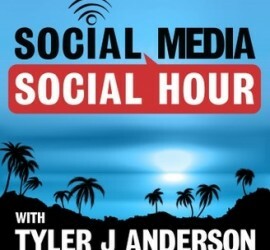 On the air for more than two years, this show features host Tyler Anderson and a legion of social media experts sharing lessons from brands and practical tactics to accelerate your social media performance. 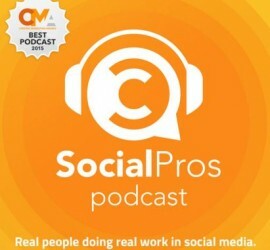 Hosts Jay Baer of Convince and Convert and Adam Brown of Salesforce “shines the spotlight on social media practitioners, people doing the real work for real companies.” These industry heavyweights discuss social media strategies and debunk social media myths in this must-hear podcast. 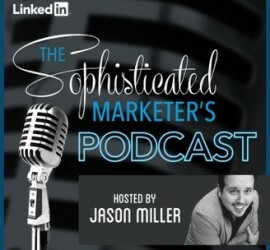 Jason Miller, Senior content Marketing Manager for Global Content at LinkedIn Marketing Solutions, is the perfect host for this podcacst. Miller chats with fellow industry powerhouses including Ann Handley, David Beebe, Brian Solis, Joe Pulizzi, and too many more to name here. Social issues such as sexism and racism in the workplace have a forum in this podcast hosted by Bob Knorpp. This weekly conversation touches on trends that impact brands and critical marketing topics such as algorithms, branded content, and social media. 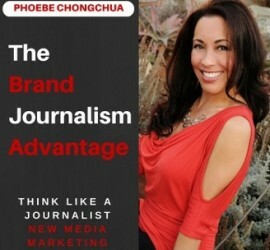 Self-described brand journalist Phoebe Chongchua highlights the value of marketers as storytellers. Guest interviews dig into subjects such as business leadership, audience building, and converting leads. 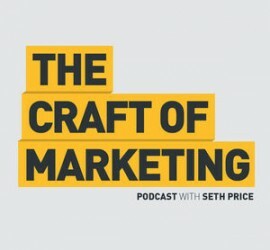 The Craft of Marketing is a podcast “by people who do it for a living: Marketers, Creatives, and Entrepreneurs.” Seth Price guides the conversation while popular speakers like Rand Fishkin and Seth Godin make appearances alongside fresh new voices. Douglas Burdett interviews best-selling authors to dig deeper into social media, sales, B2B marketing, content creation, and inbound marketing. Listen to hone your marketing toolkit and learn the key talking points on the industry’s latest publications. 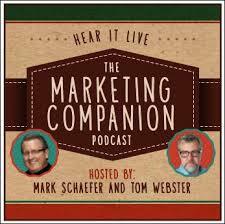 Mark Schaefer and Tom Webster host what they describe as “the world’s most entertaining marketing podcast.” Featuring comedy, celebrity guestappearances, and the latest marketing insights, it’s no surprise that this podcast has attracted a loyal fanbase. 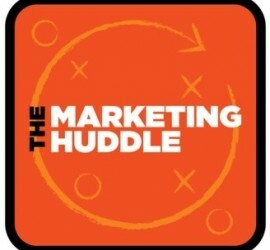 The Marketing Huddle hits all the fine points of content marketing, from developing your micro content on social media to doing great brand storytelling. Hosts Stan Smith and Laura Click draw on over 20 years of experience in the field and their work with Fortune 100 businesses, startups, and nonprofits to deliver the tips and tricks you need to succeed. 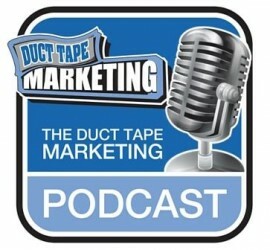 This show regularly whips up a fresh batch of B2B and B2C marketing experts from the Heartland to talk about the trends and issues shaping the industry. The podcast doesn’t just talk strategy, they also discuss the companies and brands who are doing it well. 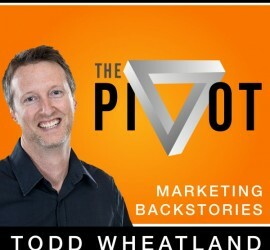 Go behind the scenes with Todd Whatland as he chats with the world’s best marketers and dives into their backstories. Guests open up and share both valuable marketing tips and personal stories that give us a glimpse into how they got to the top of their industry. 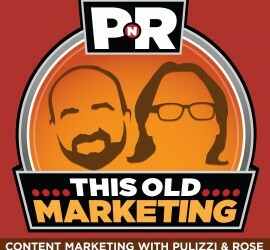 The on-air rapport of Joe Pulizzi and Robert Rose is infectious and will likely leave you in stitches. 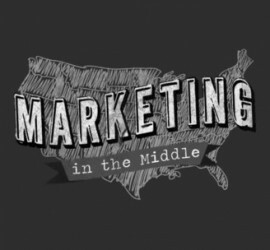 You’ll enjoy the headline news-style treatment of current issues in marketing and media, followed by their in-depth analysis of each topic. The due is a great example of how a business can produce awesome and engaging content. Thought leader Jay Acunzo of NextView teaches fundamental marketing principles through the lens of the fast-paced startup community. Nate Birt is a multimedia journalist, social media enthusiast and copy editor with experience at a variety of print and digital publications, and a Contributing Editor to the Visually Blog. Follow him on Twitter at @natebirt.